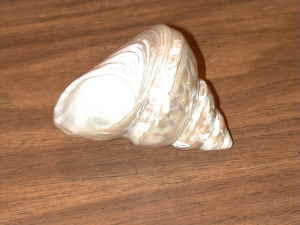 theAd>> Beautiful Ocean Snail Shell from the waters of the Bahamas. Highly polished and delicate. 5" long and 4" wide. These go for up to $50.00 in a novelty store. If by "novelty store" you mean a place for foolish tourists who are too drunk to understand the exchange rate, yeah. But they go for 5 Bucks at regular non-idiot stores. So $20 seems a bit steep. You might want to offer any prospective buyers lots of fruity rum drinks while they are looking at your dumb, delicate and highly polished shell.